Another not-really-a-recipe recipe! This easy side dish is a huge favorite at my house and now that I am able to get local potatoes again, I am excited to add this back into our dinner repertoire. I recently got these beautiful red skinned potatoes (below) from the Weaver Farm in Union Mills, North Carolina. They are just gorgeous and were perfect for this recipe. The red-skinned potatoes have such a light skin that you don’t need to do a thing to them except rinse off the dirt and chop them into bite sized pieces. This recipe only requires a few ingredients … potatoes, rosemary, olive oil, and salt. Nothing fancy. You can’t mess this up, I promise. 1. Chop your potatoes into bite-sized pieces. If you don’t have thin-skinned potatoes, you might want to peel them a little bit first but don’t feel like you need to get all the peel off! 2. Strip the leaves off of your stalks of rosemary. You can toss the leaves in whole or give them a rough chop with a sharp knife. 3. Spray your baking dish with a little bit of oil. 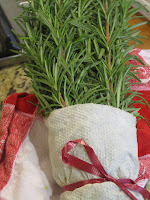 Toss the potatoes and rosemary into the pan, add the olive oil and use your fingers or 2 forks to coat the potatoes. Sprinkle a little coarse sea salt over the top. 4. Pop the dish into the oven preheated to 425 degrees. Let it cook for 45 to 60 minutes. After about 20 minutes or so, take a spatula or wooden spoon and stir the potatoes so that they brown evenly. My kids don’t love it when the potatoes are too crispy so I usually take mine out of the oven at around 45 minutes. Enjoy!